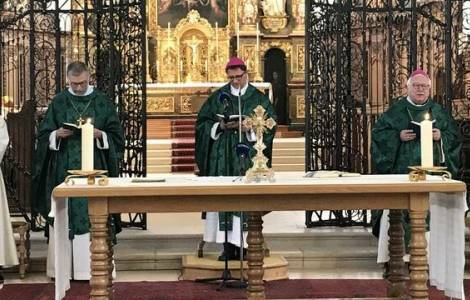 Zurich (Agenzia Fides) - "If we manage to intensify coexistence between local faithful and immigrants and to make their cohabitation more gratifying, the pastoral care of migrants represents a great opportunity for the Catholic Church in Switzerland": this is how Mgr. Jean-Marie Lovey, Bishop of Sion, responsible for the pastoral care of migrants within the Swiss Bishops' Conference, commented on the report on "Pastoral care of migrants in Switzerland". According to the note sent to Agenzia Fides by kath.ch, about one third of the members of the Catholic Church in Switzerland come from migration, a presence that marks ecclesial life in many ways. To take into account multilingualism and cultural diversity, around 110 missions or chaplaincies provide pastoral assistance to these faithful. Every year about 21,000 religious services are celebrated in over 20 languages and rituals. The data and information provided by the report "Pastoral Care for Migrants in Switzerland" were published yesterday, March 25, after being discussed by the Swiss Bishops' Conference (CES) and by the Roman Catholic Central Conference of Switzerland (RKZ) which commissioned it. This document is in fact part of a project on the future of the pastoral care of migrants, undertaken jointly by the CES and the RKZ, and examines the current situation and takes stock of five aspects: Diversity of pastoral reality: a problem or an opportunity? Future models and possible evolution of missions. Awareness raising of people active in traditional pastoral care and in the ministry of migrants. Focusing the mandate of the Migration Office on pastoral tasks. Strengthening of the principle of subsidiarity at the level of financial and administrative tasks, and more equitable distribution of funds. "The Catholic Church is marked by the seal of diversity. All baptized Catholics are part of it – says the report -. The pastoral care of migrants is a fundamental component of the Catholic Church ... it is part of the Catholic Church as an institution characterized by diversity and the multiple needs to be met. A lucid approach to the pastoral care of migrants offers the possibility of becoming more aware of coexistence among the faithful and of strengthening it, as well as promoting coexistence based on mutual respect and openness".